New Orleans natives are known for their discerning culinary palates, so you know when a mere sandwich grabs their attention (and hearts), it’s got to be one amazing sandwich. Along-standing tradition in New Orleans, po-boy sandwiches have been around since the late 1920s and now can be found at nearly every casual restaurant. Fried seafood or tender meat is stuffed inside freshly baked French bread and slathered with hot sauce or remoulade. Start your po-boy tasting tour with our list below, or head to the annual Po-Boy Preservation Festival to get the full experience. 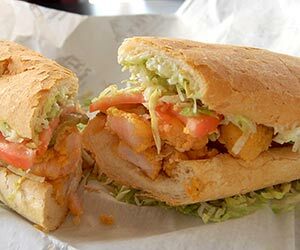 A po-boy is a sandwich made with Louisiana-style French bread (think crispy baguette with soft, fluffy insides), which is usually stuffed with fried seafood or tender meat — anything from house-made hot sausage to barbecued gulf shrimp. Order like a local and ask for the sandwich “dressed,” it’ll come loaded with lettuce, tomato, pickle and mayonnaise. Huck Finn’s Café has it all if you’re looking for a Southern dining experience: flavored daiquiris, spiked lemonade, pecan pie and, of course, a menu packed with po-boys. Go all out and try their smoked alligator sausage po-boy, which comes drizzled with creamy remoulade sauce. The frequent line out the door and the sumptuous aromas wafting out from inside are the first clues of the deliciousness diners encounter at Mother’s Restaurant. The cafeteria-style joint has been serving up home-cooked standards for more than 60 years, and one of the reasons the local keep coming back is for their juicy po-boy. Stack your roast beef po-boy high with debris (gravy) and have a seat at this uniquely New Orleans institution; you’ll quickly understand why New Orleanians always seem so happy. La Bayou Restaurant knows New Orleans ingredients, and the proof is in the po-boy — the Big Easy Po-boy, to be exact. It comes loaded with seasoned gulf shrimp, fried green tomatoes and a Louisiana-style remoulade, all served with a side of French fries. Even though Johnny’s Po-Boys has a menu touting more than 50 po-boys, such as country fried steak and alligator sausage, a locals’ favorite is the soft-shell crab po-boy. Piled with battered, flash-fried soft-shell crabs, this crunchy, seasonal sandwich really shines when it’s served with lettuce, tomatoes, cheese and a splash of hot sauce. Traditionally speaking, Central Grocery is known for the other famous New Orleans sandwich, the Muffuletta. However, they’ve been perfecting sandwiches since 1906, and we trust them with the ways of a po-boy. Try a different take with the veggie po-boy. Learn more about the famous cuisine of New Orleans. Although 15 million people will cruise next year, many travelers are confused because they heard one of these myths. Cruising is a wonderful vacation option. Don’t let myths, rumors or miss-information keep you from having your very best vacation ever! 10. I will get seasick. Only sissies get seasick! Today’s cruise ships are very stable and seasickness is a rarity. For those prone to seasickness, there are many remedies available, including “sea bands”, tablets, and a little patch that you wear behind your ear. However if people see your patch they may think you belong to a cult! 9. I will catch a Noroviruses. Noroviruses can be found almost anyplace with lots of people in close proximity, not just cruise ships. 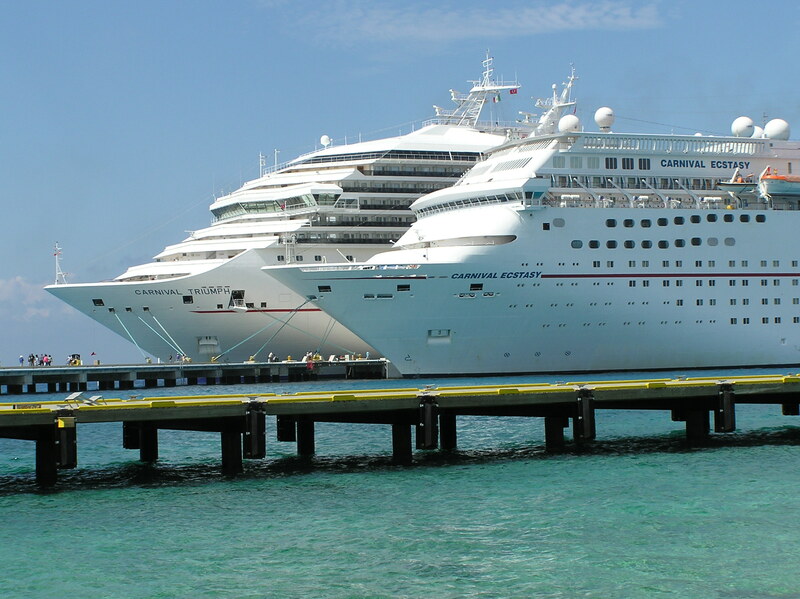 The CDC requires cruise ships to report outbreaks. It does not require schools, universities, hotels or businesses to report. So, you can see how unfair that is! Your best protection is to wash your hands frequently between trips to the buffet! 8. I’ll have to spend a lot of money onboard the ship. In an effort to keep the basic price low, most mainstream cruise lines charge for things that could be considered “extra”. However your cruise fare includes your cabin, 8 meals a day, and the traditional cruise ship amenities such as a swimming pool and excellent entertainment. You can cruise and only pay for tips and drinks if you choose. It all depends on how tight you are! 7. I have to dine at assigned times and with people I might not like. We once were assigned to a table with a couple from Croatia that didn’t speak any English! That was fun! We asked the head waiter to move us, and he did. Problem solved! So, you can move to another table, or you can sign up for open seating, or you can graze at the buffet until your belly pops! 6. Cruise ships are crowded. I have never been on a cruise ship where I could not find a quiet corner to read a book or be alone with my wife. Although a cruise ship with over 3000 passengers can seem crowded at times, it is no more so than most hotels, restaurants, or resorts. The most crowded places are around the pool on a sunny day, and the buffet at feeding time! 5. I don’t like beaches so I won’t like cruising. Since most cruises go to the Caribbean, many people associate cruising with this beautiful part of the world. However, a cruise is more than sitting in the sun by the pool, sandy beaches, or sparkling blue waters. If you don’t want to go to a beach, take a “city tour”, a sightseeing trip, or go shopping. And don’t forget … cruise ships visit every continent, and anyone who loves to travel should be able to find a cruise destination that appeals to them. 4. Cruise ships are packed with old people. People of all ages love to cruise! Multigenerational family groups are huge now. Every cruise ship has a special program for the children. Cruising is for people of all ages. 3. Cruise ships are packed with party people. Maybe in the bars late at night! The one thing all cruisers have in common is a love of travel and having fun, which doesn’t necessarily equal wild partying. Cruising is actually very family friendly. 2. Cruise ships are dangerous. Cruise ships are very safe. In over 20 years of cruising I have never felt that I was not safe. And, remember in times of bad weather, a cruise ship can change itineraries, and move to safer waters. Land based resorts can’t move! Only if you’re boring! Seriously, you can be as active (or inactive) as you like. Cruise ship activities range from working out in a high-tech gym, rock wall climbing, zip-lines, going down the water slide, swimming in the pool, to sitting on the deck and reading a book. You can learn computer skills, a foreign language, how to play bridge, or how to dance. Cruise ships spend all day in port, so you can explore all the fascinating parts of the world.